In a large stock pot bring enough water to cook the pasta and season the water with kosher salt. 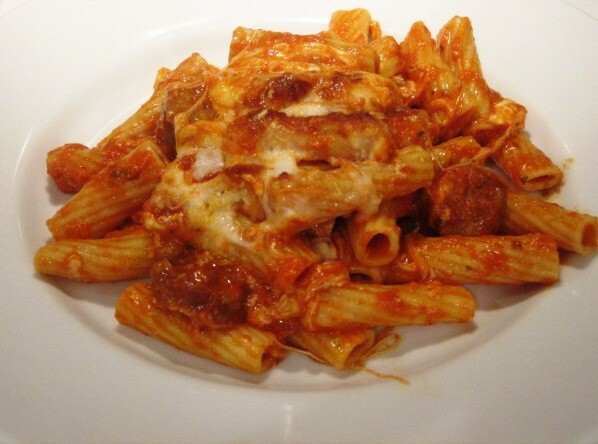 Cook the pasta to the packages specifications, drain and place in a very large mixing bowl and add the meatless sauce. If you have a frozen meatless tomato sauce, bring to room temp or warm slightly before adding the 5 cups to the cooked pasta. Cube the fresh mozzarella and add all of it to the bowl. Then add only 1 cup of the grated parmesan cheese along with the black pepper and crushed red pepper. Add all the sliced cooked Italian sausage and using a large spoon, stir all the ingredients together to combine. Grease a 9x13x2 ½ inch baking dish and place it on a sheet pan lined with parchment paper. 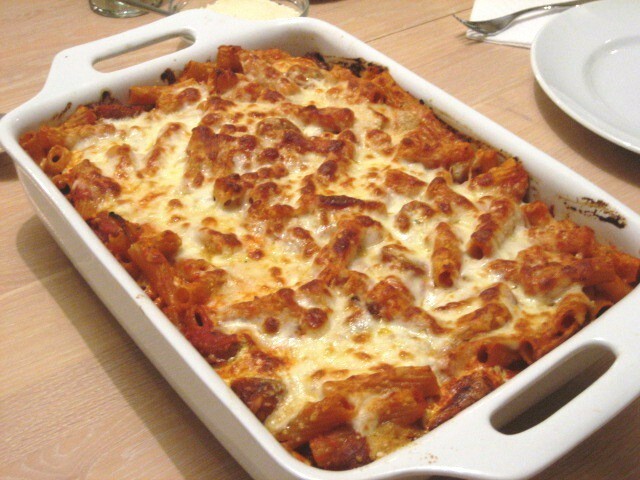 Pour the ingredients in the bowl into the baking dish and then add 1 cup of the grated mozzarella. Sprinkle the remaining ½ cup of grated parmesan cheese and bake for 45-60 minutes until hot and bubbly. If you desire a brown crust turn the broiler on for 3 minutes to brown the cheese. *If you are using a store bought tomato sauce you may need to season it with minced garlic that has been sauted in a little olive oil. Tracy’s meatless gravy has 15 cloves of garlic and a lot of flavor which is key to this dish.